With equities closing moderately mixed, the VIX remained in cooling mode, settling -8.0% @ 22.55. 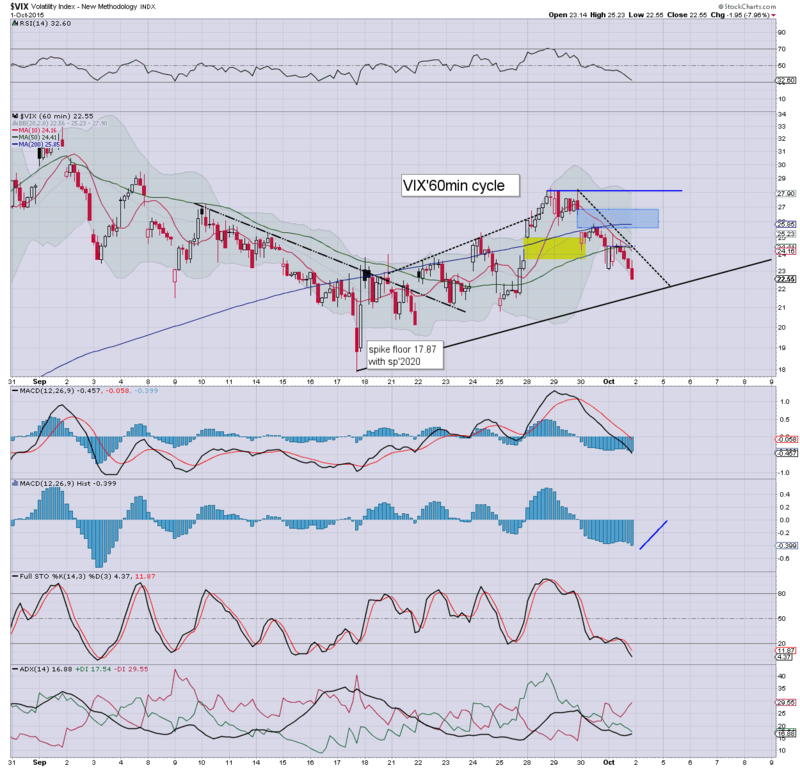 Near term outlook is offering renewed equity weakness to the sp'1870/50 zone.. which would equate to VIX 27/28s. Sustained action in the 30s looks unlikely in the current cycle. The VIX was notably weak across the day, despite the broader equity market -1% at one point. What does it mean? 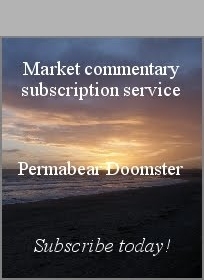 Well, certainly, the market is not in the least bit worried about another collapse wave in the immediate term. Yet, the hourly/daily cycles both offer VIX 27/28s as early as tomorrow. Were that the case.. it'd equate to the sp'500 -40/50pts.. something that might sound a lot.. but then.. Monday closed -49pts. US equity indexes closed moderately mixed, sp +3pts @ 1923 (intra range 1927/00). The two leaders - Trans/R2K, settled +0.6% and -0.3% respectively. Near term outlook is bearish... to the 1870/50 zone.. which would make for a rather natural mid term 'marginally lower low'. *closing hour action: a real choppy mess.... stuck around the 1920 threshold. ... and today comes to a close. All things considered... equity bears have at least seemingly stalled the recent nonsense bounce from 1871 to 1927. The fact we already hit 1900 earlier is a bonus.. and is arguably suggestive of much lower levels tomorrow. 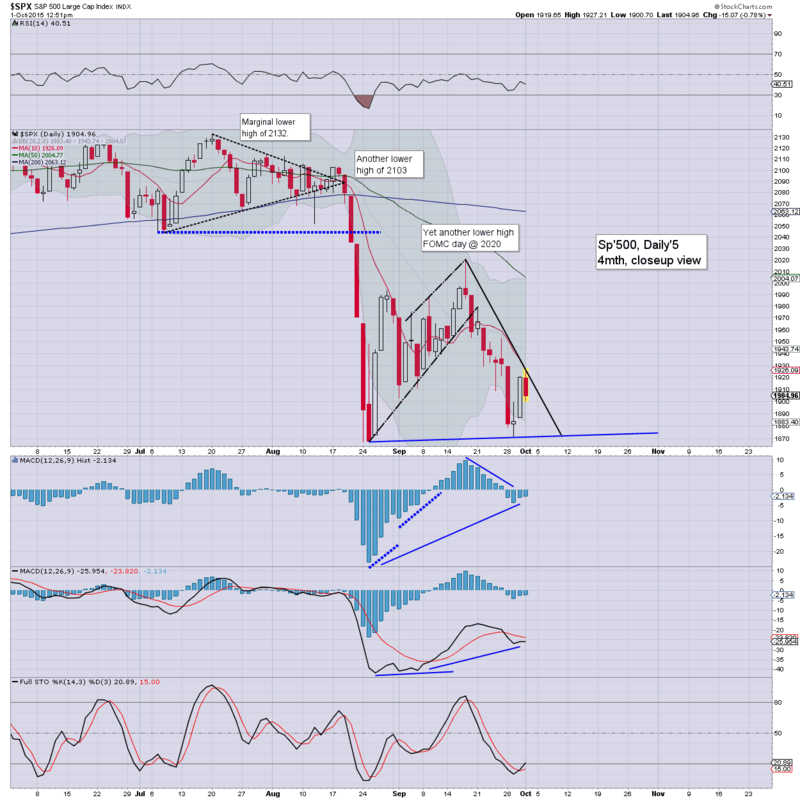 US equities remain moderately weak, sp -6pts @ 1913 .. a long ways below the overnight futures high of 1940. VIX continues to show a total lack of concern.. but the 27s look very viable tomorrow.. on a move back toward the Aug' low of 1867. 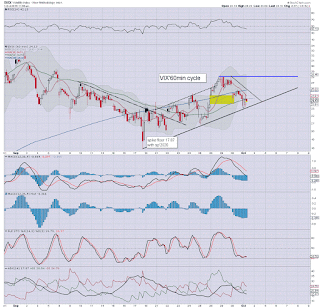 A brief break - forming a marginally lower low in the 1850s appears possible. Considering the borderline horror of seeing the ES offering the equiv' of sp'1940 overnight... the fact we've already hit 1900 today is some relief. The hourly equity (and even VIX) cycles are offering increasing weakness into the weekend. 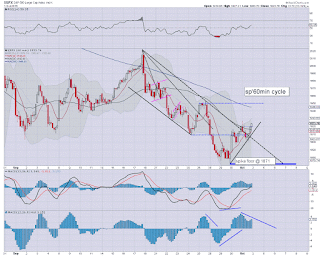 The bigger weekly/monthly cycles continue to increasingly negate all bounces. US equities remain moderately weak, sp -12pts @ 1907, but a significant way below the opening high of 1927. A daily close in the 1905/1890s remains viable. VIX is notably still failing to show any upside kick... but the hourly cycle will be offering the 27/28s tomorrow afternoon.. which would likely equate to sp'1860/50s. 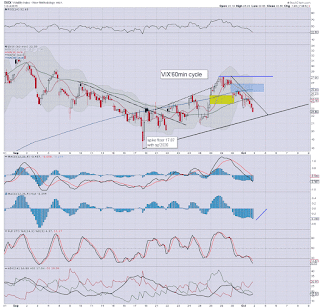 *if VIX 27s tomorrow.. TVIX should be higher by around 15/20%.... the 14.50/15.50 zone looks very viable. So... two hours to go... and all things considered.. equity bears should be very pleased with today. 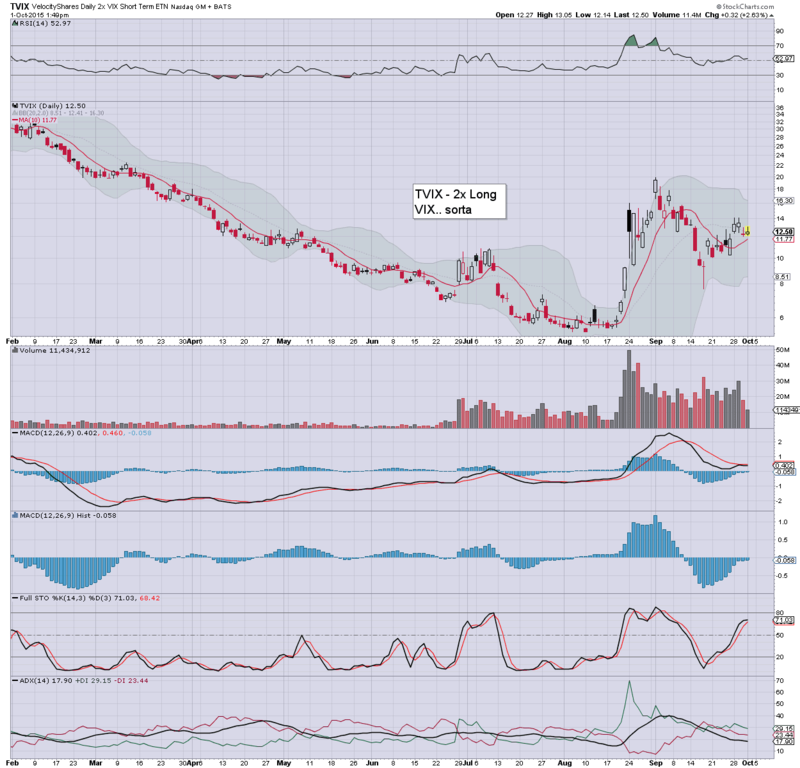 BTU -12%... having now seen a reverse split... the coal bears are merely re-shorting it again. TWTR -7% whom they name CEO will make little difference. TSLA -4%.. maybe they're not charging enough for the new model X ? Perhaps 0.25 million would suffice? 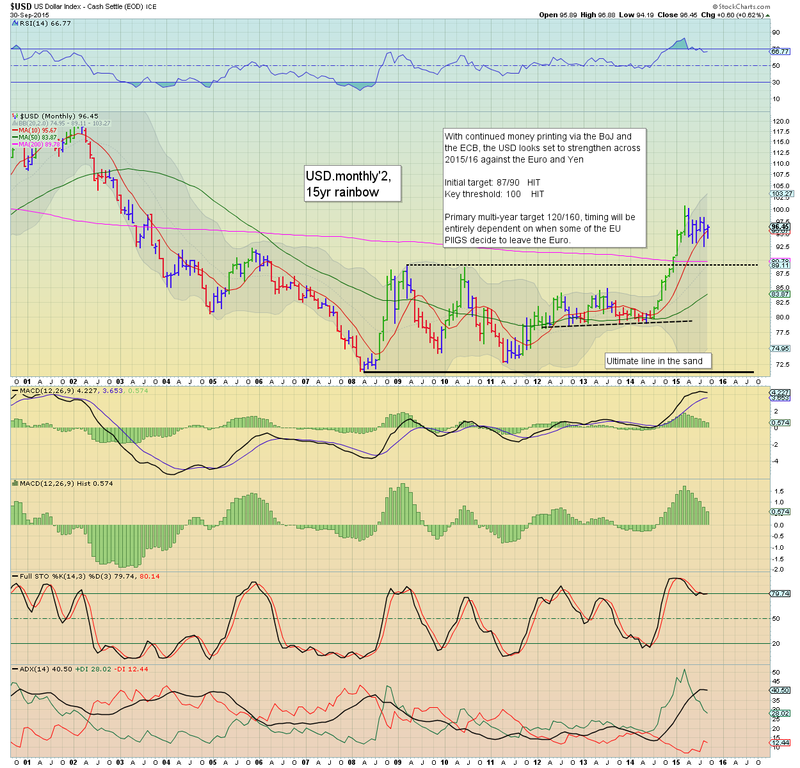 GDX -2.6%... despite precious metals mostly holding together. First target is now 1890/89...a full test of the Aug' low looks pretty reasonable tomorrow. US equities have seen a significant down swing from the opening high of sp'1927 to 1900. The daily 10MA has held as first key resistance on the daily cycle. Next downside target is the Tue' low of 1871.. and that does look probable tomorrow. VIX remains notably not able to push upward... yet. As noted a little earlier.. best case was a daily close in the 1905/00 zone.. and I'll stick with that. Anything <1900 would be a real bonus.. and merely increase probability of 1870s tomorrow. 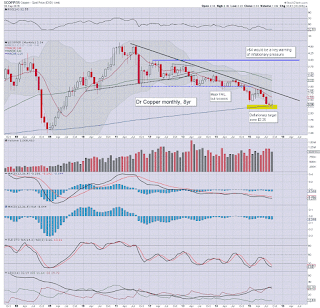 *the bigger monthly cycle is offering 1850s as a viable 'marginally lower low' in the near term.. before upside into earnings season. *I remain broadly short.. seeking to clear the decks into the weekend. With each hour that the bears can hold the market from making a new intra high, underlying price momentum on the smaller cycles is turning back toward the bears. There is threat of a strong snap lower on any sustained break under the hourly 10MA.. but more probable early tomorrow. 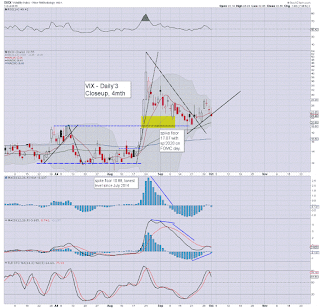 *for now... VIX is showing zero sign of market concern... a daily close in the 25s would be useful. Not much to add. Today is arguably just about halting the short term upward trend. As someone on the short-side, I'd be content with any close at 1920.. or under. 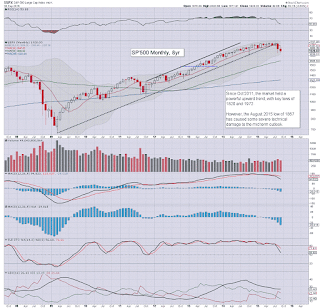 *lots to say on the new Oct' monthly candles... but more on that later. 12.14pm.. I would certainly agree.. VIX is a little odd right now... only fractionally higher. as Dow -190pts. 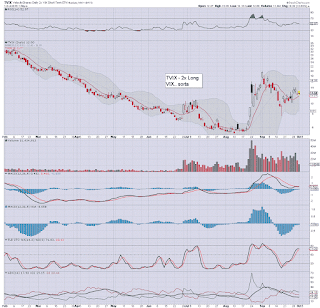 Will need to see 1870s tomorrow to see VIX 26/27s. 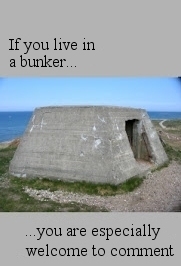 The 30 threshold looks out of range. 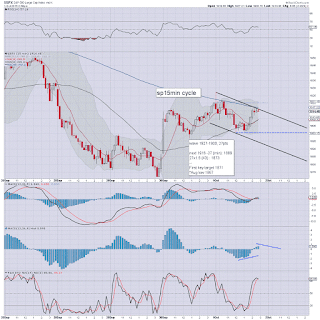 US equities have put in a short term high of sp'1927.. along with VIX 23.09. First target for the equity bears should be a break and hold underneath the hourly 10MA.. which will be around 1910 in the 11am hour. VIX is trying to turn positive... first target is the 26.50/27.00 zone. 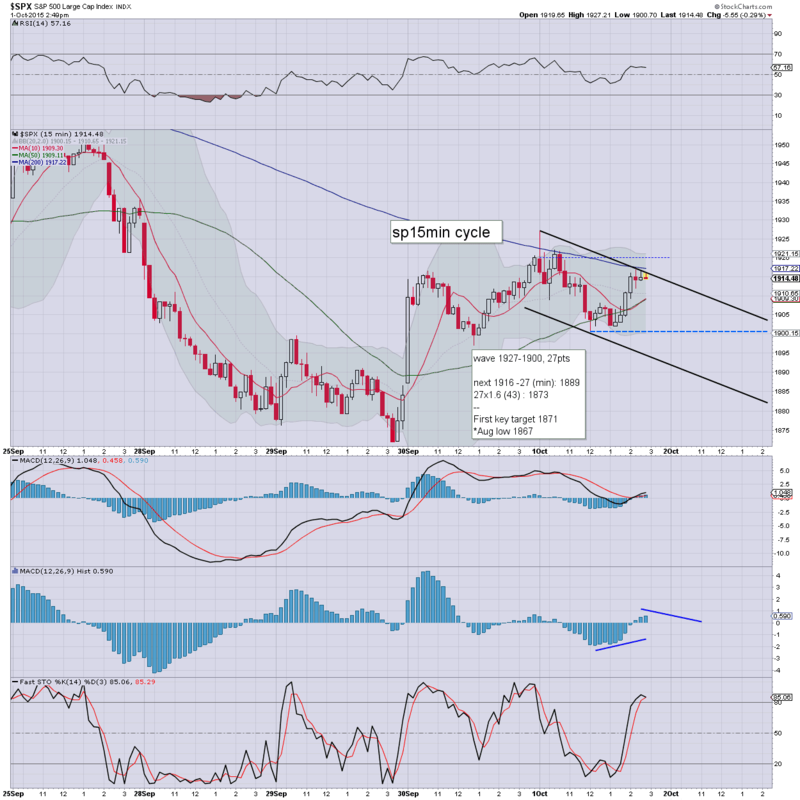 Today is setting up better than feared.. from the overnight high of sp'1940. Most realistic case is a daily close in the 1920/15 zone. Best case is Thursday close 1905/00... which would offer good chance of the 1870s by tomorrow lunch time. 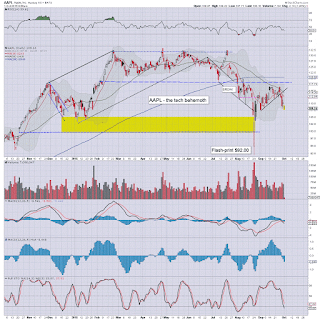 notable weakness, AAPL -2.4%.. and that is not helping inspire others in the tech sector. US equities open a little higher, but have seen a notable reversal right from the start. Hourly equity cycles are set to see a bearish cross at some point tomorrow morning. 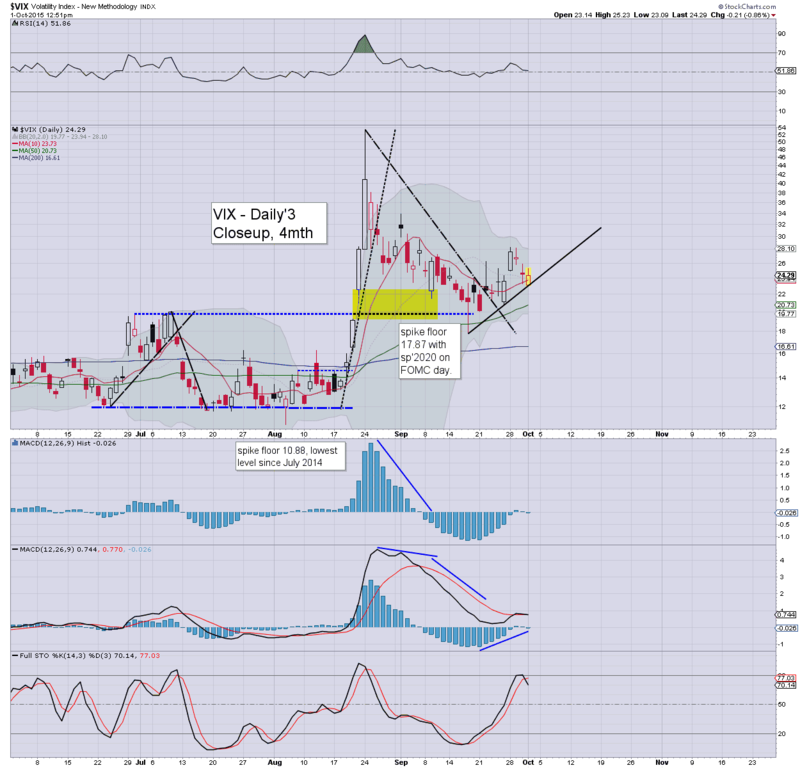 VIX is similarly offering an opening reversal candle from 23.09.... first target is the 26.50/27.00 gap zone. 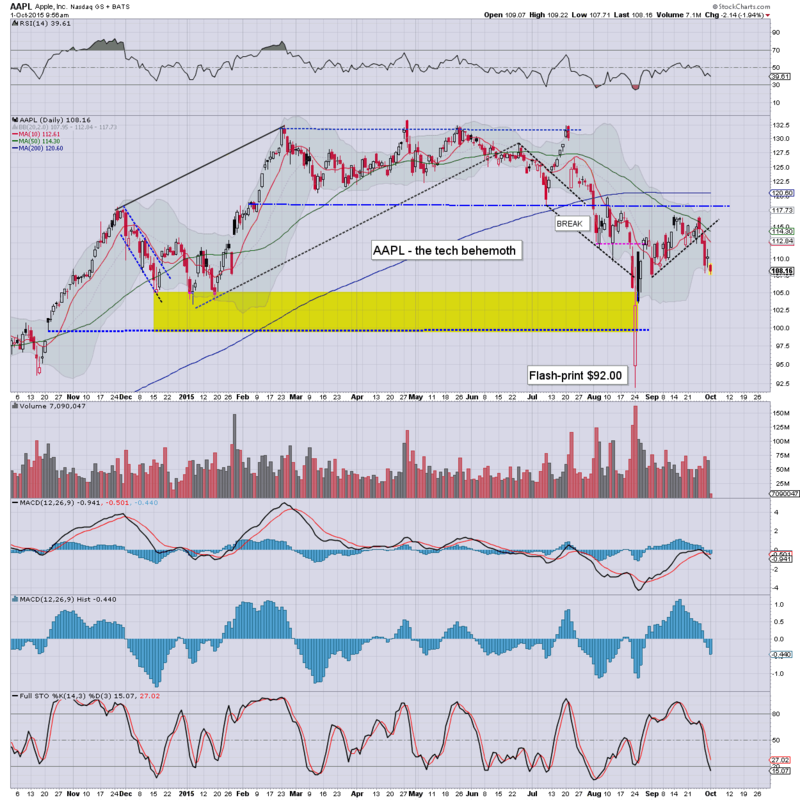 *EXITED AAPL-short from $108.20 just earlier... so.. that is one position dropped ahead of the weekend. 4 to go. 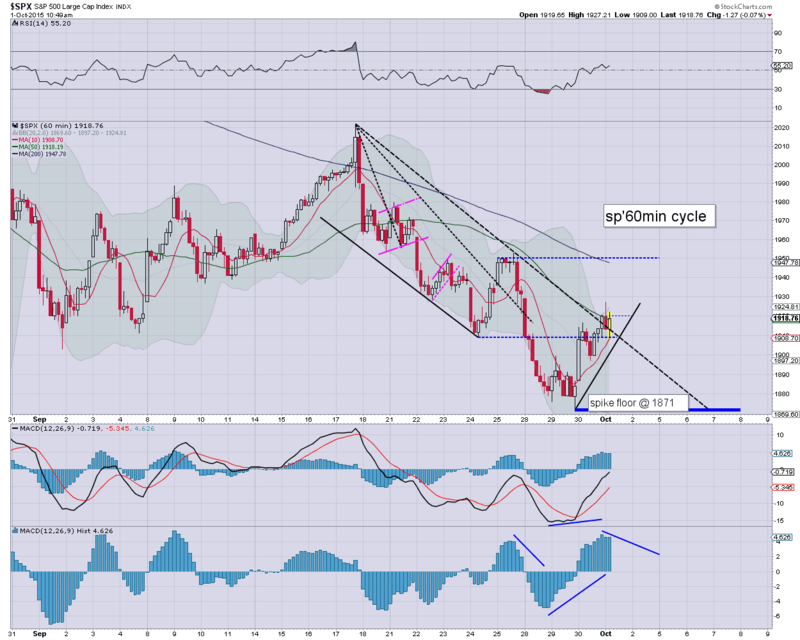 So... today is set to see some chop.. but more importantly... an hourly down cycle is setting up for tomorrow. Very hard to say whether we'll be trading under sp'1900... but a down cycle IS due before the weekend. Those currently still short (myself included).. should get opportunity to exit at better levels before the Friday close. The daily chart shows little sign of underlying strength... but I'm more than content to be out of that one. Good morning. US equity futures are moderately higher, sp +10pts, we're set to open at 1930 (overnight high: 1940) . The USD is broadly flat in the DXY 96.50s. Gold -$3. Oil is +2.2%... back in the $46s. For what its worth... welcome to October. A new month, and no doubt the Oct' monthly price momentum will tick more in favour of the equity bears. The immediate issue though... how high will the current nonsense go? We've now climbed from 1871 on Tuesday afternoon to 1930.... 59pts (3.0%). 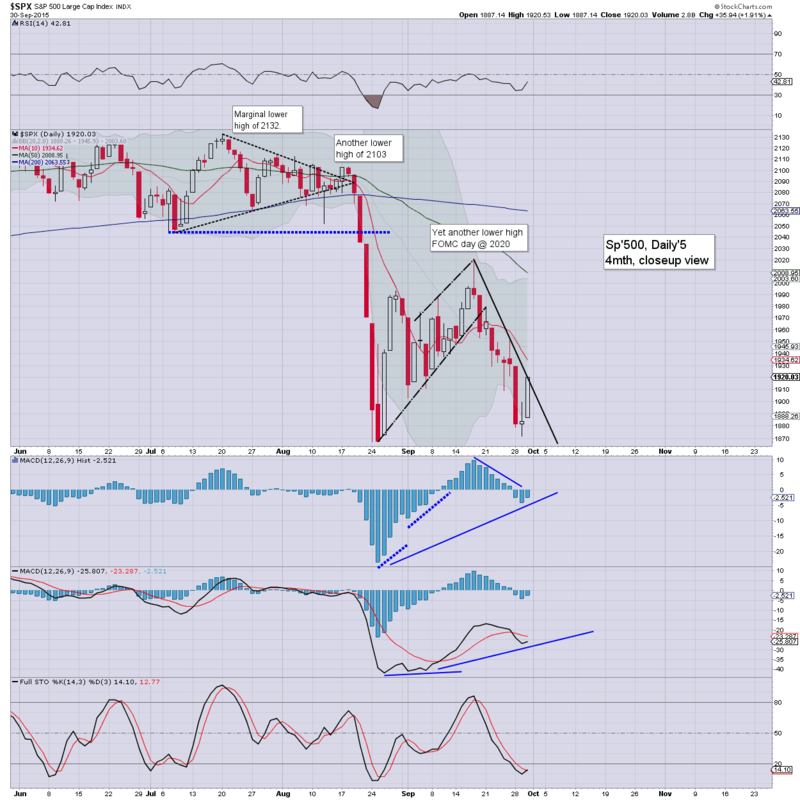 Best case scenario right now for the bears... a Thursday net daily decline of 5/10pts.. with a 20/25pt fall tomorrow. 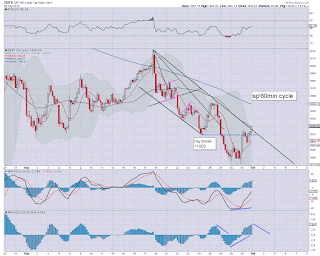 That would offer a weekly close under 1900 and keep the near term trend bearish. As it is.... I've LOW confidence in that... and instead fear a straight up run to the 200dma in the 2040/50s. That IS a real threat as we're clearly back to the 'bad news is good news' mantra. *I remain short... but will look to exit tomorrow.. or next Monday at the latest. I simply can't hold beyond that... little point. 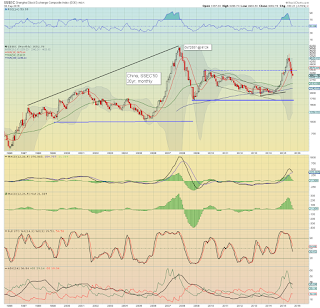 Japan: +1.9% @ 17722. It is notable that the Nikkei saw a net Sept' decline of -7.9%. 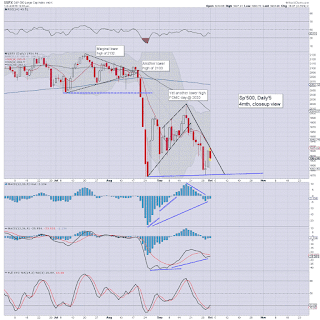 The outlook for Oct' is NOT bullish. China.... CLOSED until next week. Have a good Thursday... if you can. 9.40am.. EXITED AAPL-short.. from $108.20. 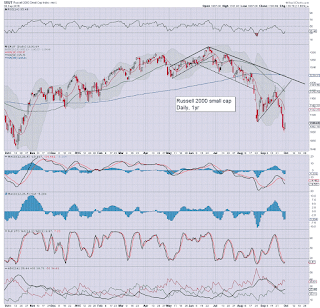 It was a second consecutive month for the equity bears, with the sp'500 net lower by -2.6% @ 1920. Most world equity markets had another rough month, with the Shanghai comp' -4.8% @ 3052. The USD saw a moderate gain. 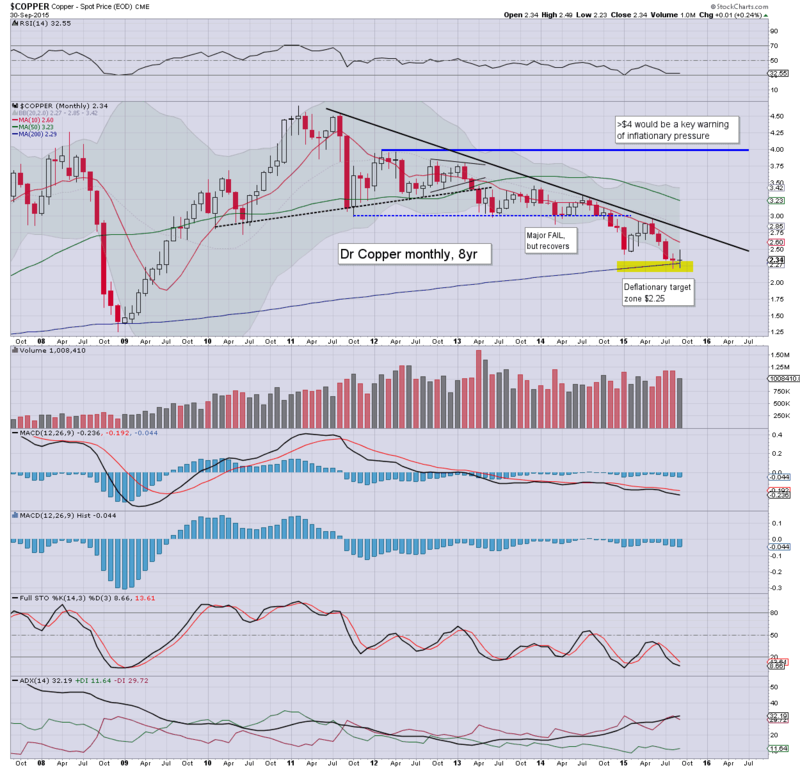 Copper and Oil both remain within their deflationary paths. The first pair of sig' net monthly declines since 2011. 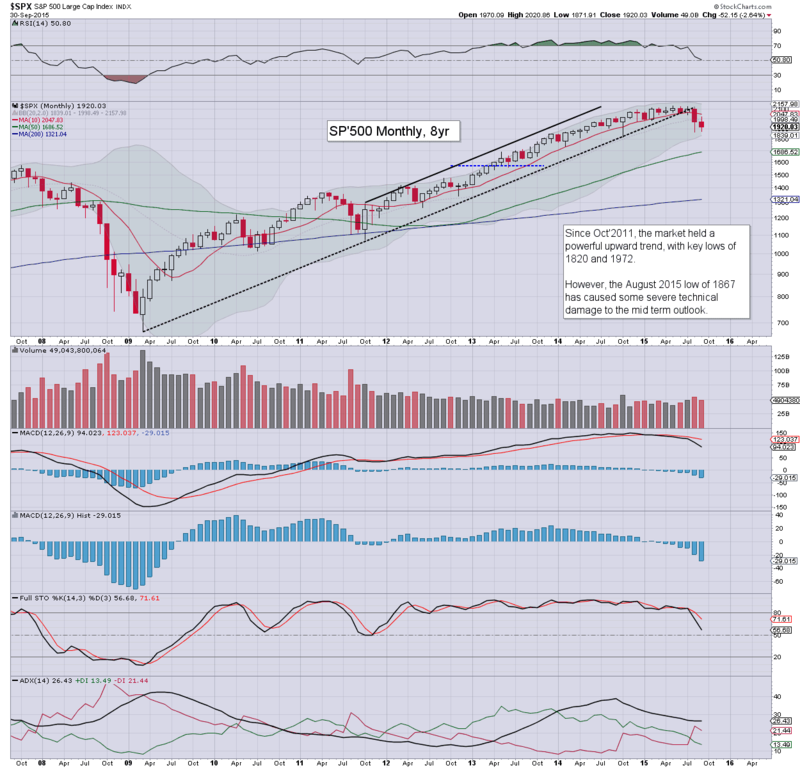 The mid term trend remains bearish... with viable upside to the 200dma (2050s).. along with the monthly 10MA (2047.. and falling). Underlying MACD (blue bar histogram) continues to swing in favour of the equity bears.. and lower levels look probable in Oct/Nov. The China market settled lower for the fourth consecutive month. Underlying MACD (green bar histogram) cycle continues to tick lower, and is set for a bearish cross at the Oct' 1st open. 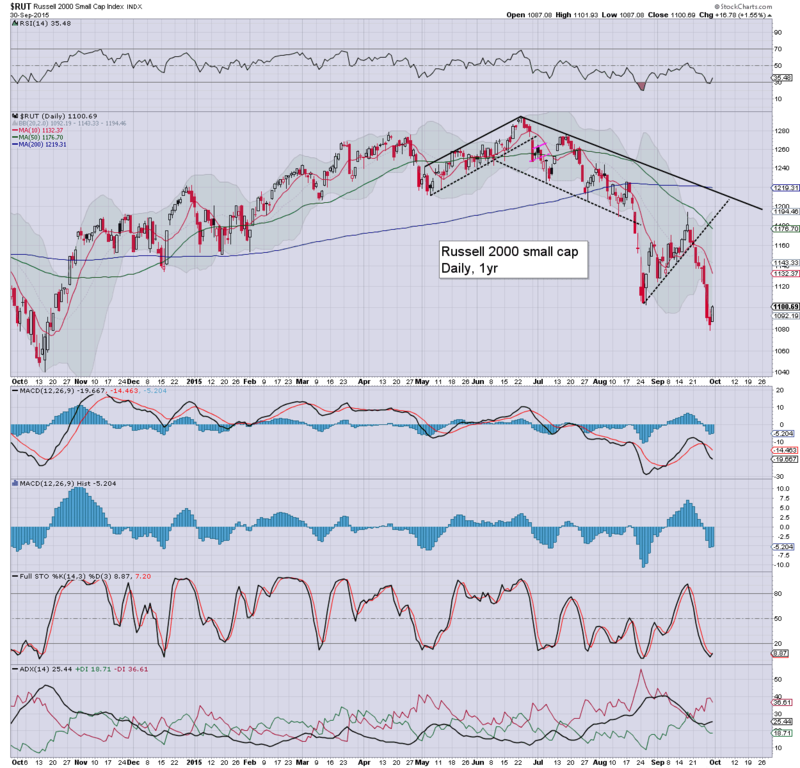 There remains high probability of further downside to the 2500/2000 zone before year end. 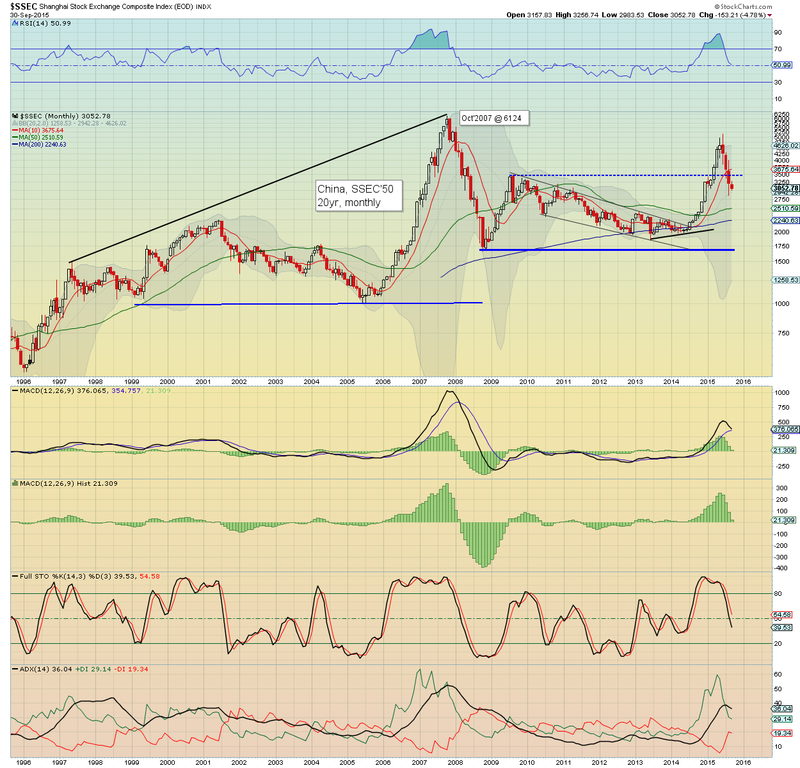 A moderate net monthly gain of 0.6% @ DXY 96.45. It is notable we now have 6 blue candles... price structure is a giant bull flag. There is threat of downside to the 90 threshold before the next push higher >100, and then onward to the 120s. A net monthly gain of 0.2%. 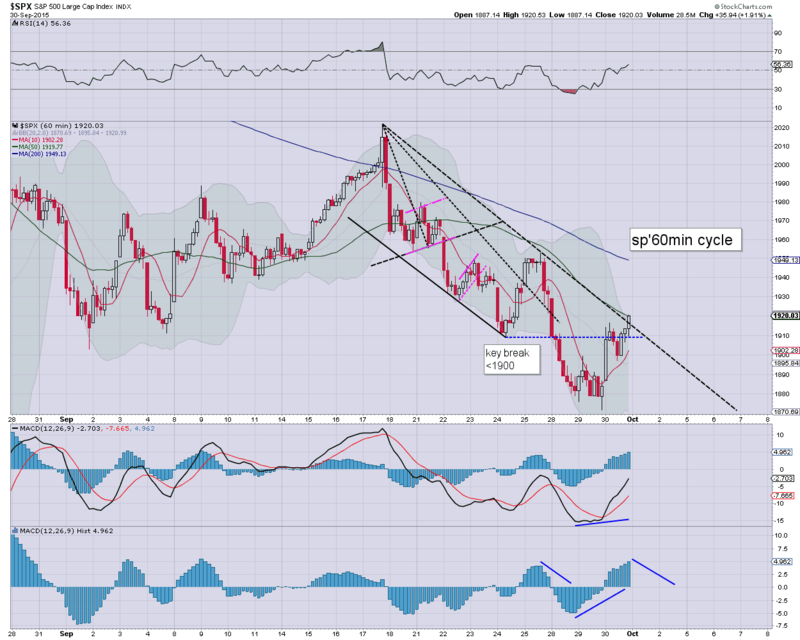 Broadly.. Copper remains very weak, and a test of the $2.00 threshold seems probable. 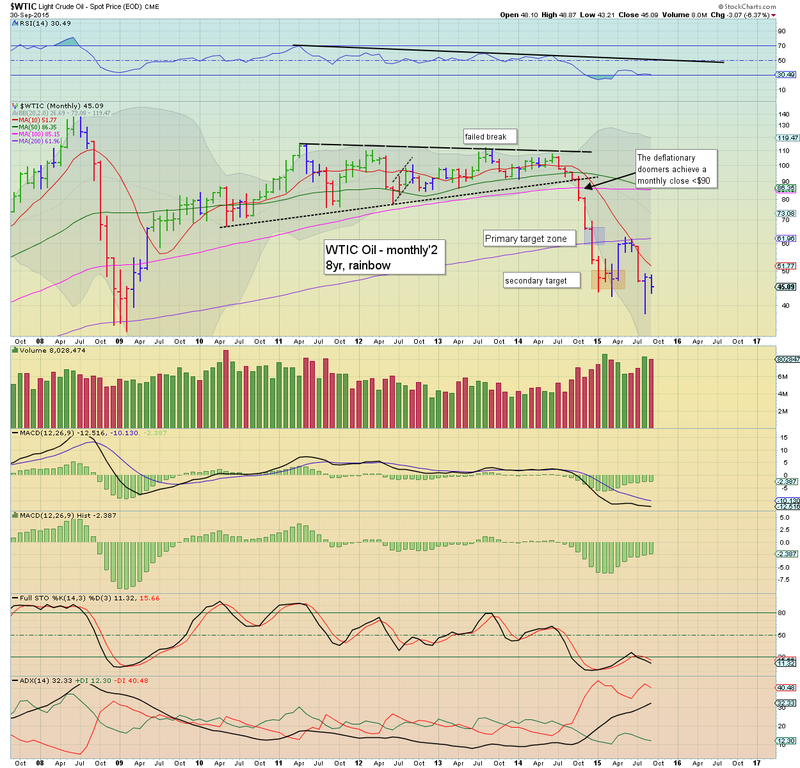 A severe net monthly decline of -6.4% @ $45.09... as supply remains above demand. 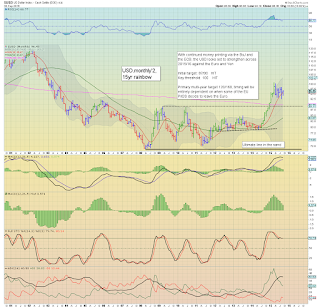 For now.. there is zero sign of a floor.. and sustained action in the $30s looks probable. Today was clearly a major disappointment. What was the markets excuse for a near 2% ramp? Was it mostly technicals, or is the market now seeing bad econ-data (I refer anyone to today's recessionary PMI number of 48.7) as good news again? Tomorrow will be day'11 since the FOMC high, and frankly... on balance, it now looks like we have a marginally higher low of sp'1871. 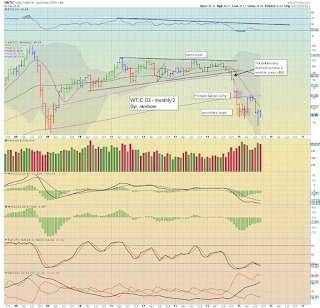 If that does hold, then next target is the daily 200MA and the monthly 10MA... in the sp'2040/50s. I certainly can't hold short all the way up to the sp'2000s, and will endeavour to exit at the base of the next hourly down cycle. In theory.. that should be this Friday.. or certainly no later than next Monday. *the second market leader - R2K, remains very bearish.. having taken out the Aug' low of the 1100 threshold. 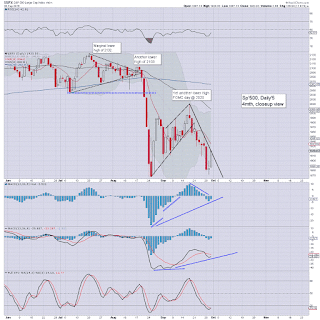 Next support is the Oct'2014 low of 1040. 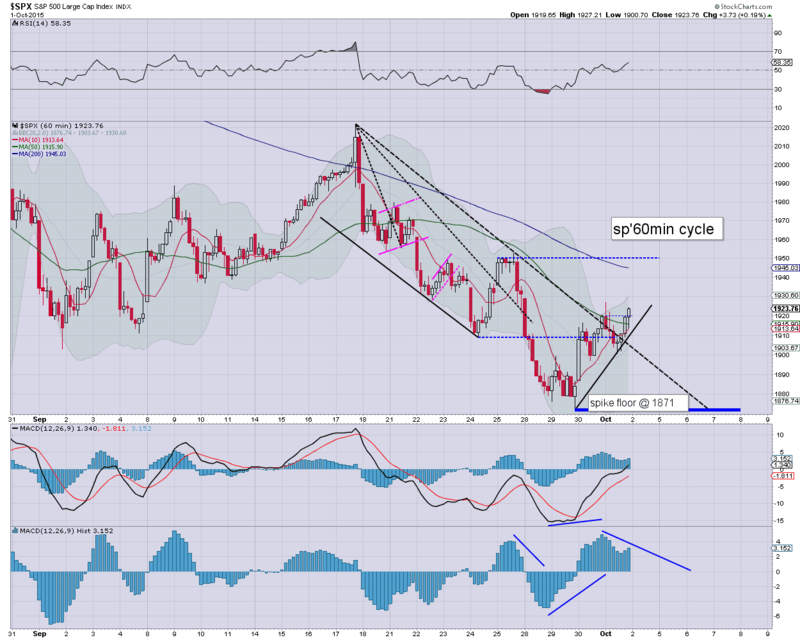 Daily MACD (blue bar histogram) cycle on the sp'500 is starting to tick higher. At the current rate, there will be a bullish cross this Friday/next Monday.